Happy Friday Sugar Fix Readers! What an amazing weekend it has been over here at The Loft! And to top it out, and OUTSTANDING week of ridiculously good weather. No complaining here, right? Chicago, we love you! Over here in our clinical world, we had the pleasure of seeing, as always, some amazing patients. We had an opportunity to place two implants on a patient who was missing two of her back molars. Those are crucial for eating mobility. She was able to get her teeth taken out and have those implants placed right away. That saves you months of healing! Once our patient gets the clear from Dr. Alli Alberts, we will then place implant crowns on top of those guys! She will be able to use them just as she would with the teeth she was born with. 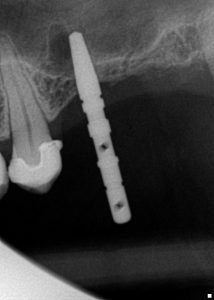 A great place for an implant! Another exciting event was… PHOTO SHOOT DAY this week! We had so much fun spending the day at Low-Res Studios over in the West Loop, creating the most creative looks! Who would pass up the chance to get their sugar fix from some cotton candy?! It made a perfect prop for one of Dr. Emery’s shots. 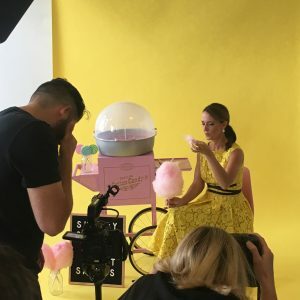 Here at Sugar Fix Dental Loft, Dr. Jessica Emery loves to create fun, exciting new marketing content for her practice. It let’s us connect with our patients on another level and shows dentistry in a new light. Philipe and his team at Mirar Productions, were there to create some spectacular video footage. Their eye for creative content within the world of videography always mesmerizes us. Philipe on set with Dr. Emery! Another BIG thank you goes out to Meagan of M Lindsay Photography! She captured the most dazzling photos and we would recommend her to everyone. You must go check her work out! We are anxiously waiting to see our final proofs of our shoot. Thank you so much for our dental soiree team and every single person that was there to make the day go flawless! So make sure to keep up to date with us on our social media platforms by following us, and keep a look out on Chicago’s ‘L’ trains, you may see Sugar Fix throughout your commute! Enjoy your week, and enjoy that HEAT.